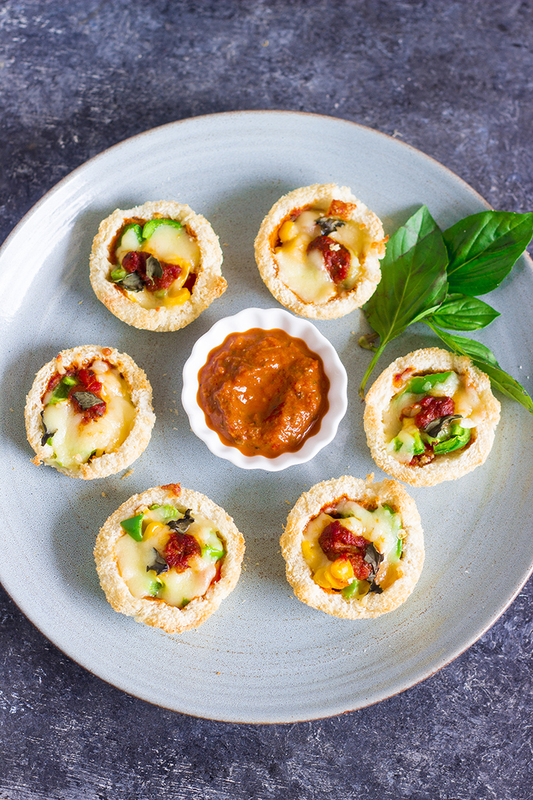 Pizza in a cup - cups made with bread, filled with your favorite pizza toppings and sauce, topped with cheese and baked until the bread is crisp and cheese is oozy. Tell me, do you love Pizza? Did you just say yes??? Then you will LOVE this recipe. 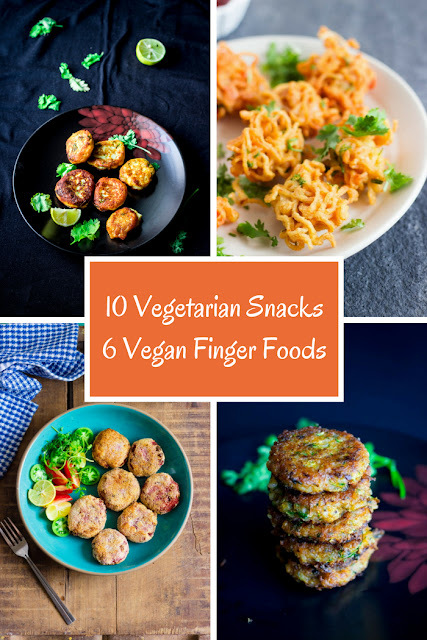 So, since you asked for more snacks, I've been sharing recipes for snacks here. 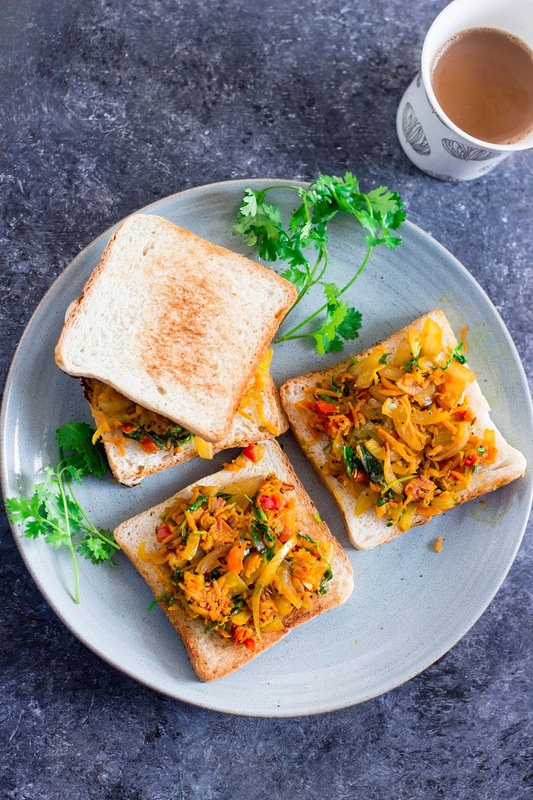 Just early this week, I shared the recipe for Masala Bread Toast - a popular bakery item in Bangalore. And today, I bring to you Pizza in a cup. Cute, right? 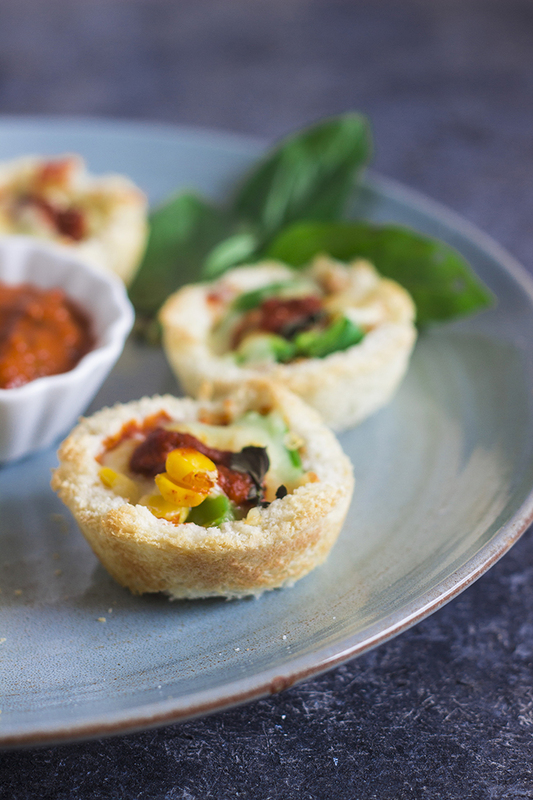 These Pizza cups are straight out easy to make and they are highly customizable. All you need are fresh bread slices, your favorite pizza sauce, toppings - again just use what you love or you have leftover in the fridge, and cheese. Yes, lots of cheese. I say the cheese is never enough. Okay, so there is a reason I mentioned fresh bread slices up there. The fresher the bread, the softer and easier to work with. The bread won't crumble when you try to shape them. I had a few slices that just crumbled on touch, so bad for the pizza cups. Use wholewheat bread to make it healthier. Next, the Pizza Sauce. I made my own sauce following an older recipe of Eggplant Pizza, and I think this Basil Almond Pesto will also go famously. You can get creative and use this Manchurian Sauce instead or you can just buy the Pizza Sauce. If you don't want to go through all the fuss, just use Ketchup and add some Italian seasoning or Oregano to it. The best part of any Pizza is the toppings. I kept mine super simple - chopped tomatoes, capsicum and sweet corn. It tasted delicious. But this is where you want to get creative and add what you love or as I suggested before, just use up leftovers. Also, a brilliant way to sneak in those healthy veggies your family won't eat. 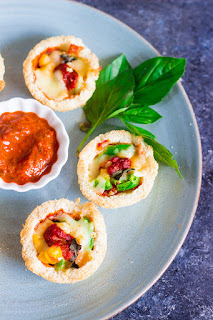 I topped my Pizza Cups with Mozzarella cause I love the way the cheese melts and gets all stringy. Use any cheese you love, but remember, for cheese, less is never more!! Add more cheese, always! Kid's birthday parties - What's more fun is you can make the kid's add their own toppings. Cocktail Parties - let's just agree, these are perfect for any party, really! Snack boxes?? I wouldn't highly recommend this, cause the bread may get soggy, but if you have non-fussy family, I say go ahead. I actually kept aside a few for 2-3 hours and ate them later and they still held and were just as tasty. 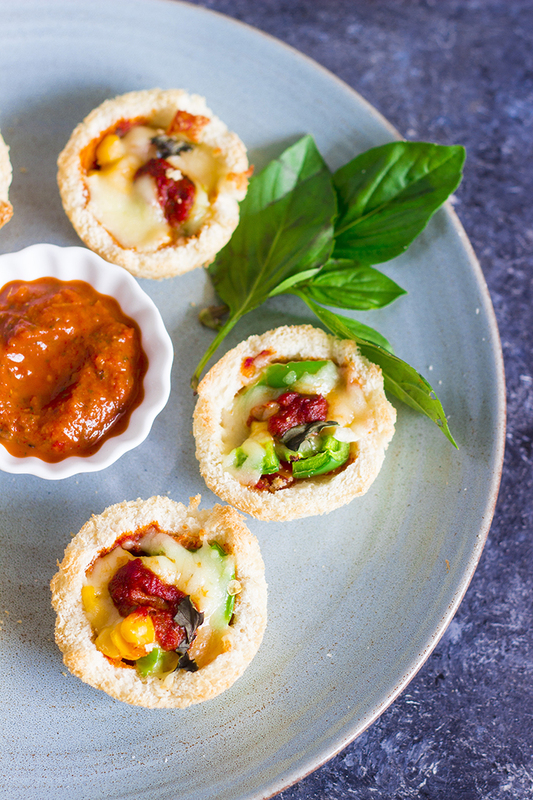 Cups made with bread, filled with your favorite pizza toppings and sauce, topped with cheese and baked until the bread is crisp and cheese is oozy. 1. Lightly sprinkle the bread slices with water and tap to wet the bread slightly. 2. Flatten the bread using a rolling pin. 3. Cut the bread into a circle using a bowl or a box cover. 4. Grease the muffin tray generously with olive oil. 5. Carefully place the bread into the muffin tray in the shape of a cup. See video above for reference. 6. Spoon in the pizza sauce. 7. Add the chopped tomatoes, capsicum and boiled sweet corn. 8. Sprinkle Italian seasoning or oregano if using. 9. Top each cup with 1 Tbsp of shredded cheese. 10. Top with a little bit of sauce and chopped basil leaves. 11. Bake in a preheated oven for 10 minutes at 200 degree Celsius. CHILLI. BASIL. POTATO. Winning combo!!! There is something about that aroma of Basil that awakens. It's so FRESH and EARTHY. It somehow reminds me of the fragrance of first rain. RAIN - I'm dying for some rains to bring down the heat. And all my thoughts are invariably leading to monsoons. Until, then I'm left with just sniffing away on some fresh Basil. This Chilli Basil Potato is my FAVORITE Potato appetizer. We always order it at our local Thai restaurant. We tried other appetizers - Sesame Potato, Cauliflower Pepper Salt etc etc. But we always come back to these Chilli Basil Potatoes. I wanted to make something really really healthy this weekend. Really!!! But those potatoes were really just staring me in the face from their basket. I thought they said PICK ME too... or may be that was just a voice in my head. Eh, who cares? These Chilli Basil Potato were totally worth the Potato indulgence. I stir fried them instead of deep frying, so I kept some end of my healthy eating bargain. 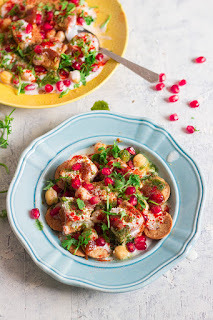 You know the other advantage of these Chilli Basil Potatoes? Your kitchen smells AMAZING. That's right! That wafting aroma actually got the I-am-addicted-to-my-phone hubby dearest Raj into the kitchen to check out what was cooking. Don't you simply hate how these men are always on... actually almost into their laptop / phone/ tablet ? I wish we were in simpler times, when a phone meant a box in the corner of the room with a cord hanging off it. Leave me a comment if you have succeeded in getting your man off his gadget. And you know what? Back in those days, no food was bad food. 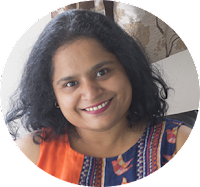 There was no good fat, no bad fat. No high sugar, low sugar. No "let's-hate-the-potato" club. Anyway, back to the Chilli Basil Potatoes, I marinated them in some lemon juice and salt for around 10 minutes. And then stir fried them in sesame oil along with chilli flakes and fresh basil. They made a beautiful side for my homemade burgers. Potato stir fried with chilli flakes and fresh basil to make a delicious appetizer or snack. Cut the Potato into long thick strips like french fries. Mix them with salt and lemon juice and keep aside for 10 minutes. Drain the potatoes and keep aside. Heat oil in a pan and drop the potato in it. Stir the potatoes well so that they are all coated by the oil. Now cook on low heat until the potatoes are done. Add the turmeric powder, chilli flakes and the basil leaves and stir fry for 2-3 minutes until the basil leaves wilt.